Something has happened in my house the other day that has never happened before. I actually ran out of body butter. The kind I use at night that feels good on my skin and leaves me moisturized. This is a major shock because I keep it piled in my cabinets and I can't believe I ran out. Then I realized I had yet to try Josie Maran's Whipped Argan Oil Body Butter. ($35) I've been wanting to try this forever, mostly because I love everything that Josie Maran comes out with. She really is someone I look up to, she's a makeup icon so I was soo excited about this one. What it is: It's not heavy, it's my butter—silky, intensely hydrating body butter that smells subtly yum and gives sweet relief to the driest skin. Packed with luscious oils and whipped to a feather-light texture, it sinks in instantly for velvety soft skin in a flash. Spread the love and feel the difference. and my front, and everywhere else. It's hard-core enough to quench parched elbows and heels, but never greasy or sticky. And the two fresh, natural scents, vanilla apricot or sweet citrus, lightly linger on my skin like an all-day aromatherapy infusion. What's in it: No wonder it feels so good. My Whipped Argan Oil Body Butter is a powerhouse of more than ten plant oils and extracts, plus the star of the show, 100% Pure Argan Oil, with its restorative and antioxidant properties. What's not in it: I dont clutter my butter with ingredients that are toxic, or unethically tested. That means no parabens or harsh artificial fragrances. And no guinea pigs, unless you count my friends and family. How I use it: Long, hot baths are a treat that motherhood doesnt allow for very often. I'm lucky to grab a shower when I can. Either way, my skin loves to soak up the deliciousness of Body Butter after bathing, when my pores are open and receptive to all that whipped, velvety goodness. What surprised me is that this comes in 3 luxurious scents. Vanilla/Apricot, Sweet Citrus, and Vanilla Bean. I tried the Vanilla/Apricot and the scent is absolutely without a doubt refreshing and delightful. When you smell it, you only get a tiny hint of Apricot, the rest is Vanilla. The formula and texture is thick and not greasy at all. I like to take a shower at night and rub this all over my body. When you get under the sheets and into bed you feel so relaxed and so soft, it's hard to explain until you actually do this for yourself. This is by far the best body cream/butter I have found. For some reason I'm finding a lot of my absolute favorites lately; I'm not sure if it's because of the companies I've been working with lately, or everyone has just stepped up their game in the beauty/makeup game. Either way I've never been happier, especially with Josie Maran. If you haven't read any of my Josie Maran reviews before, I'm a huge Argan Oil fan. It makes my hair soft, my skin moisturized and it's the best thing for your cuticles. So knowing that there is Argan Oil mixed into this body butter makes it that much better. I'm sure that's the ingredient that leaves your skin feeling incredibly soft. I won't be surprised if other companies start putting Argan Oil in all their products. It is the secret ingredient that does so many fabulous things, the next best thing to coconut oil. 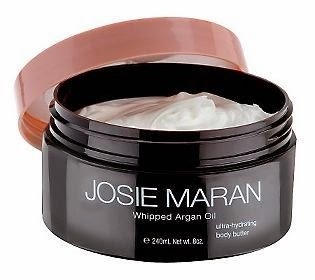 You can buy Josie Maran Whipped Argan Oil Body Butter on Josie Maran's website and Sephora. The price is $35 for a 8 oz jar, but I warn you, you should buy two because if you love it as much as I do you will want a backup!